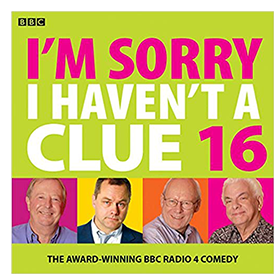 The numerous I’m Sorry I Haven’t A Clue audio compilations are the best selling recordings of any radio show still being broadcast today. Alongside these, there are also live recordings, special editions, DVDs and books available to buy. Four more extended episodes from the award-winning BBC Radio 4 series, specially compiled by producer Jon Naismith. Featuring special guests Rob Brydon, Victoria Wood, Susan Calman and David Mitchell. Do words fail you? 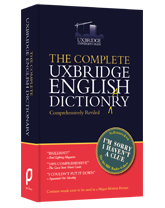 Never again, once you've become the proud owner of The Complete Uxbridge English Dictionary. Every word has a meaning, but over the years those meanings change. Dip into these helpfully illustrated pages and you'll find many of the words you use every day without ever realising that their up-to-date definition is something entirely different. The 288-page full colour and fully illustrated 40th anniversary ISIHAC companion; a collection of the best games, jokes and nonsense from the past four decades, with a foreword by Stephen Fry. The ideal gift for all ISIHAC fans. 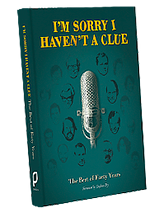 Just as hilarious but slightly lighter, the paperback version of the official companion to over forty years of I'm Sorry I Haven't A Clue with an introduction by Stephen Fry. Recorded over two legs of the 2008 sell out tour - the series' first ever live shows in its 35 year history. The thirteenth official ISIHAC collection. The twelfth official ISIHAC collection. The eleventh official ISIHAC collection. The tenth official ISIHAC collection. The ninth official ISIHAC collection. The eighth official ISIHAC collection. The seventh official ISIHAC collection. The sixth official ISIHAC collection. The fifth official ISIHAC collection. The fourth official ISIHAC collection. The third official ISIHAC collection. The second official ISIHAC collection. The first official ISIHAC collection. The best unbroadcastable bits from ISIHAC first live recordings. The best unbroadcastable bits from ISIHAC live recordings. These CDs feature two special programmes to celebrate 30 years of "I'm Sorry I Haven't a Clue". BBC Radio 4 celebrates the remarkable life of Humphrey Lyttelton. The wonders of the English language. A new companion to the wonders of the English language. A selection of Humph’s best home truths. Graeme Garden and Barry Cryer don their kilts. 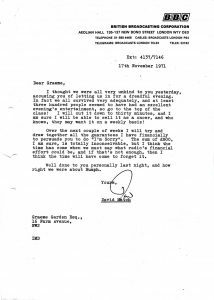 Played by Graeme Garden and Barry Cryer. "Gambling Fever" sees Hamish becoming addicted to gambling after winning a Sporran Cosy. Hamish and Dougal, two elderly Scotsmen played by Barry Cryer and Graeme Garden. 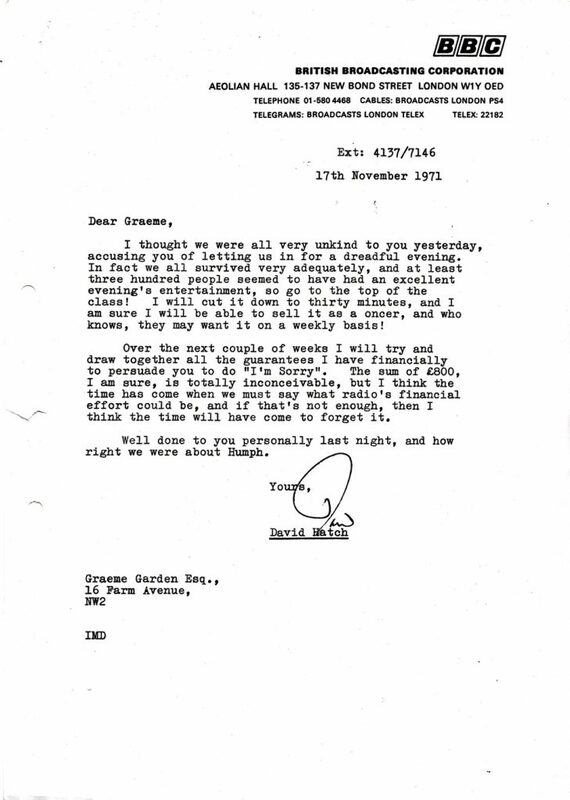 A letter from producer David Hatch to Graeme Garden, following the recording of the pilot episode.